We have landed! It is officially the countdown into summer, and as always we are kicking off with a simple wonderful prize. The iconic, award winning Swiss designed and engineered Mini and Maxi Micro scooters from Micro Scooters are the scooters you see everywhere. Beloved by hundreds of thousands of the families in the UK the multi award winning scooters are renowned for their durability, ease of use and innovative designs and colours. We are giving one lucky winner the chance to choose their very own Maxi and Mini Micro Scooter sets for them to have fun with over the summer and beyond. I really can’t imagine why anyone wouldn’t want to win this one – so just fill out the widget below and you are away. Crabby colouring so you can start thinking of the beach early! One winner can choose a Mini and Maxi Micro scooter from the range. Delivery to the UK & Ireland only. Mini micro in teal and orange is fab and for the maxi the coral pink! I love the Mini Micro Scooter – Special Edition Purple/Raspberry and I know one of my girls would definitely go for the Maxi Micro Scooter in her favourite colour lime green! I would like to win a Raspberry/Lime Mini Micro Scooter and a Maxi Micro Scooter Silver Set. I would pick the Mini Micro Scooter – Special Edition Candy Blue and the Maxi Micro Foldable Scooter – Blue. Create Your Own Mini and Maxi scooters. this looks fab for my son!!! My littlun would love the Mini Micro Scooter – Popping Pink Set! I’d choose the Mini in Raspberry and Lime and the Maxi in Cool Coral! I’d love to win the Create Your Own Mini and Maxi scooters. Special edition purple, the twins wouldn’t fall out over the colour as they usually have blue for the boy and pink for the girl. Ooh a Mini Micro Special Edition Purple/Raspberry and Maxi Micro 2 in 1 Orange would be lovely. A maxi micro special edition coral pink. I would like the Maxi Floral Dot Set and the Micro Scootersaurus Set. i would choose the popping pink scotter for 3-5 year olds. Would love the mini in Aqua and the maxi in purple. A micro balance bike would be good to go with a scooter! I like it in yellow but the kids may have other ideas with the choice available! Mini Micro Scooter – Orange! My daughter is purple mad loves this one Maxi Micro Scooter – Special Edition Purple. A mini micro candy lilac and a maxi micro special edition coral pink! The red maxi micro scooter would be amazing!! Red and special edition red. My sons loves red! It’s got to be the camo maxi! I would choose the Micro Balance Bike in Green and the Maxi Micro Scooter in Orange. Popping pink and maxi red = great! These seem easy to use. DD would need a maxi I think…. The Blue Dinosaur Mini Micro Scooter and the Maxi Pirate Scooter Please! the red and silver scooter !! My girly would love a mini micro scooter in pink! The mini in popping pink and the maxi in neon dot. The Blue Dinosaur Mini Micro Scooter and the Maxi Pirate Scooter. we are always using this!! oh no!!! I put the answer in the box instead of my name! I said i would like a Mini 2 go in pink! If I was lucky enough to win I would choose the Mini Micro Scooter – Special Edition Lollipop Red and the Maxi Micro Scooter – Silver. Fingers crossed! I’d choose the Mini Micro Scooter – Popping Pink Set & Maxi Micro Scooter – Floral Dot Set if I won. Can’t seem to get the widget to load, anyone else have this trouble? The Mini Micro Scooter – Special Edition Candy Blue and the Maxi Micro Scooter – Special Edition Purple please. My son would love the Micro MX Trixx scooter in blue/black – looks funky! I’d go with purple for both of them! No arguments, red micro and red maxi. we dream of the micro monster bullet scooter! I love the mini daisy and heart and the special edition coral maxi. 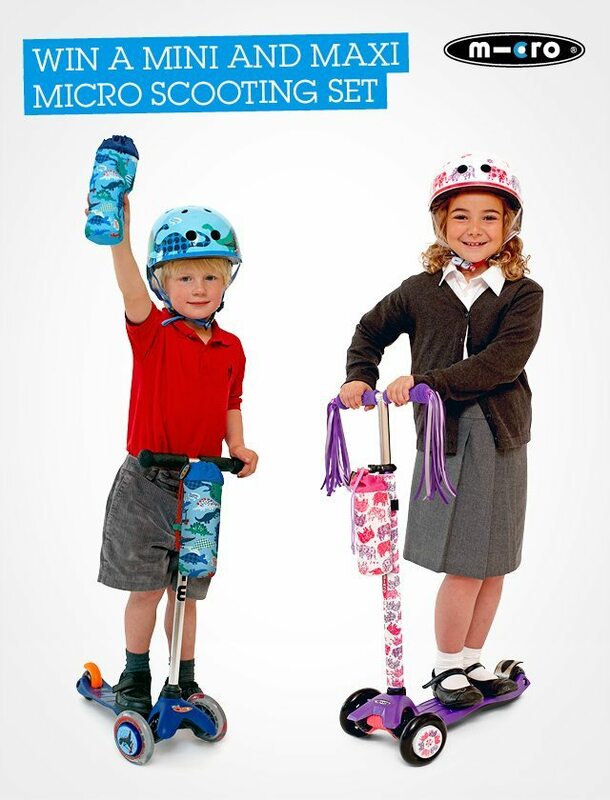 and for my 5.5 year old I would love the Maxi Micro Scooter Blue. I accidentally put that I commented as Ali Johnson instead of my full name Alison Johnson – whoops! If I was lucky enough to win, I’d choose the Green mini and lime green maxi. I would like to win Mini 2 Go: Blue, for my grandson. The mini micro T-bar purple & maxi T-bar in Blue! I’d choose the Mini Micro Lollipop Yellow Scooter Set and the Maxi Micro Scooter Purple with Coloured T-Bar – Special Edition. I would love the purple t bar mini and the same colour for the maxi! So that my girls could have the same! I’d love a mini seat 3in1 in blue and a maxi in Purple! I’d love the Mini Micro Jungle Explorer and the Maxi Micro Lime Green T-bar! Mini Micro 3in1 Scooter Candy Blue with Seat and O-Bar Handle & Maxi Micro Joystick Scooter 2in1 Olive Green, please! I like both in purple. The jungle mini for my 4yo, and the lime green maxi for my almost 6yo! Mini Micro Scooter T-Bar Aqua and Maxi Micro Scooter Lime Green please! One of the 3 in 1 scooters – mini to go for my granddaughter, shes 16 months. I would love the Maxi Micro Scooter Purple with Coloured T-Bar, and the Mini Micro T-Bar Purple :) Amazing range! We’d go for the “Yellow Yummy” mini micro scooter. It’s a fab colour. Maxi Micro Scooter, Purple with Coloured T-bar – Special Edition. The mini in blue & maxi in coral pink would be my choice. Mini micro in popping pink (or even better, a seat one in yellow) and a maxi micro in coral pink would be my choices, thank you. I LOVE the Micro sprite floral! The best scooters in town! Camo green Maxi and aqua Mini please! I love the mini micro in green for my youngest boy and the maxi micro in lime green for my other boy. I LOVE the Micro sprite floral design – how cool is it! I would pick the mini micro Lollipop Yellow scooter set and Maxi Micro covert camo. I would choose the Mini Micro Lollipop Yellow Scooter Set and Maxi Micro Scooter Coral Pink with Coloured T-bar thank you!